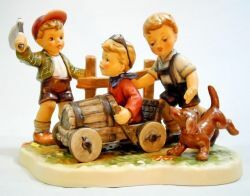 The Hummel Moments In Time Collection was introduced in 2002 with "Soap Box Derby" - the first limited edition figurine in the series. Each subsequent year a new annual figurine was offered with each figurine's production quantity being strictly limited. Initial edition quantities were limited to 5,000 pieces. After several years the edition sizes were lowered to 3,000 pieces and in later years the production runs were lowered even further to just 2,000 figurines (the 2012 edition was limited to 1999 pieces). Their minimal edition sizes have led to them to being highly coveted by collectors and as a result they can now command premium prices on the secondary market. What you see here are some of the limited edition Hummel Moments In Time Collection figurines available for sale on eBay. If you don't see exactly what you're looking for use our site search to see even more items! hummel moments in time "just fishin'" 2350 7" tm9 box and certificate. hummel 2365 moments in time "bee creative" 7" retail $1300 box and cert. hummel moments in time "can i play" 2097 11" box and cert. hummel 2290 moments in time "sailing lesson" 9" retail $1700 box and cert.